February 9, 1918: Municipal Journalarticle. 100,000 Tons of Coal Wasted by Chicago. “The Chicago Waterworks pumps and sterilizes two and a half times as much water as the consumers actually use, the balance-waste and leakage-amounting to more than the combined consumption of Milwaukee, Boston, Cleveland and St. Louis. The coal required for pumping this waste during one year amounts to about 100,000 tons-more than enough to heat all the public schools during the present coal-famine winter. This useless pumping adds about half a million dollars a year to the operating expenses. In addition, three and a half million dollars is spent annually in an attempt to keep the plant adequate for the extravagantly excessive service, and even this amount is not sufficient. If the waste could be stopped, no more such additions need be made for more than thirty years to come. The wasteful consumption of water so reduces the pressure in the mains that over more than three-fourths of the area of the city it is less than half of that recommended by the National Board of Fire Underwriters; and in only one of the 35 wards does it equal the recommended pressure. The above startling facts are derived from a report entitled ‘The Waterworks System of the City of Chicago’ that has just been published by the Chicago Bureau of Public Efficiency. This report contains 207 pages, 28 of which are occupied by diagrams, photographs and other illustrations. A considerable part of the report is devoted to a description of the waterworks system of the city, but the purpose of the entire report is to make public and emphasize the enormous amount of unnecessary waste, and the undoubted increase in this which will occur, with the consequent waste of public funds involved, unless radical methods are carried out for greatly reducing it. The main points brought out in the report we will endeavor to give in a brief synopsis. With approximately two-and-one-half million population, Chicago is pumping into its water mains 14 per cent more water than New York receives by gravity (with no pumping costs) for the use of a population of five and one-half million. It supplies more water than any other waterworks system in the world. Commentary: Many of the large cities in the U.S. were battling with water waste due to the enormous costs. Universal metering and an aggressive rate structure eventually reduced water waste dramatically in most cities. 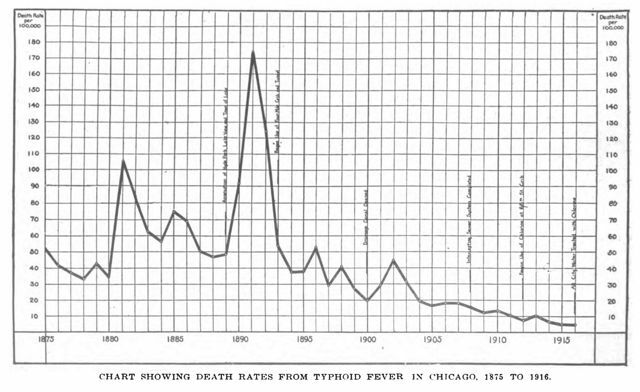 The figure below showing the dramatic drop in the typhoid death rate is similar to the one I included in The Chlorine Revolution: Water Disinfection and the Fight to Save Lives. Chicago was an excellent example of how water disinfection saved lives. Reference: Municipal Journal. 1918. “100,000 Tons of Coal Wasted by Chicago.” 44:6(February 9, 1918): 105-6. 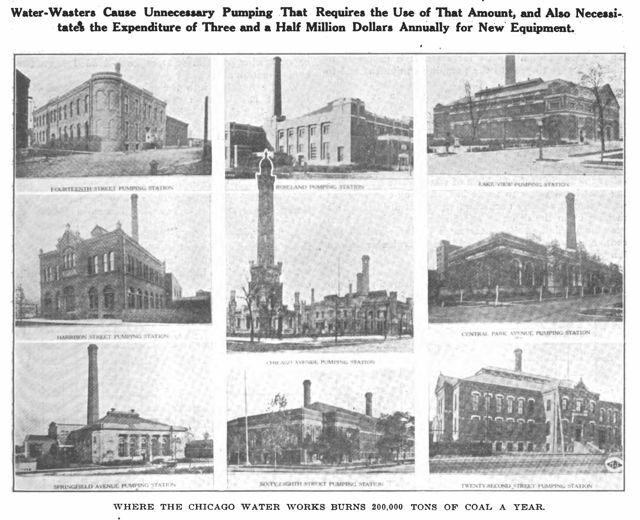 This entry was posted in Year 7 TDIWH and tagged Chicago, drinking water, public health, The Chlorine Revolution, typhoid fever, water, water history, water waste on February 9, 2019 by safedrinkingwaterdotcom.